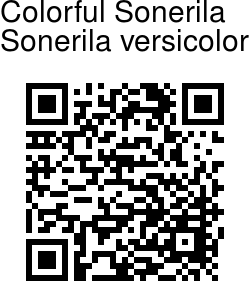 Colorful Sonerila is an erect woody undershrub, whole plant violetish. Leaves are 3-10 x 1-2.5 cm, ovate lanceshaped, long tapering at tip, broadly narrowed at base, oblique, sawtoothed on margins with mucronate tip for serrations, penninerved. Leaf-stalks are 1-2.5 cm long. Flowers are borne in cymes at branch-ends. Flower-cluster-stalks are 1.5-4 cm, sparsely glandular hairy. Flower-stalks are 0.2-0.4 cm long. Sepal tube is 3-angled, 0.4-0.5 cm, glandular hairy; sepals broadly triangular, glandular hairy. 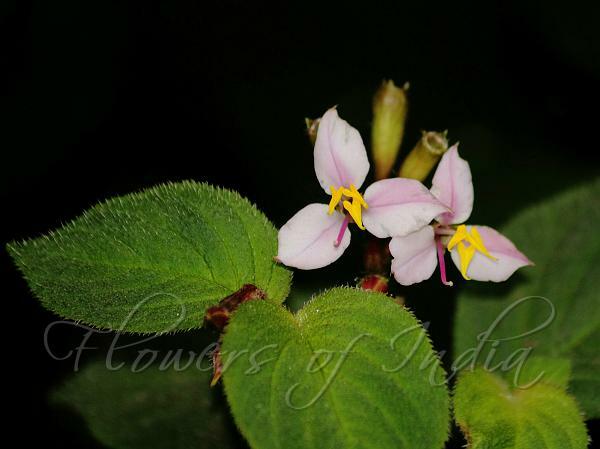 Petals are 0.5-0.6 cm long, 0.3 cm wide, ovate-lanceshaped. Anthers are 0.4 cm, narrowed, style 0.5-0.6 cm long; stigma capitate. Capsules are top-shaped, 1-1.2 x 0.4-0.5 cm, 6-ribbed. Seeds elongate, tubercled; raphae forming a capitate appendage. Colorful Sonerila is endemic to Southern Western Ghats. Flowering: June-December.